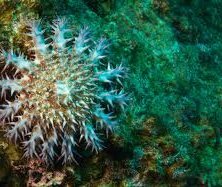 The crown-of-thorn starfish has been responsible for the disappearance of vast swaths of coral gardens around the world, the various coral gardens around Tioman being no exception. Crown-of-thorn starfish can grow up to 50 centimeters in diameter, are covered in venomous spines, and are voracious predators, preying on hard coral in particular. 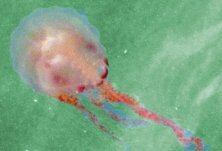 But the diving community is stepping up to try and stem the sheer numbers of this coral enemy pest. 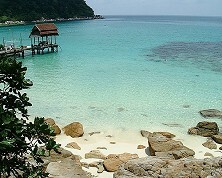 In fact, the Tioman diving community organizes up to half a dozen crown-of-thorns collection events every year. Basically, these crown-of-thorns reef clean-ups entail the physical removal of as many crown-of-thorns starfish from our coral gardens as can be collected, and then disposing these by burying them on land. 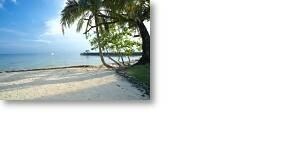 Usually, we enlist the help of up to 30 volunteers, divided into groups of 3 to 4 divers. Two of these divers will be the more experienced ones, the ones doing the actual picking up of the crown-of-thorns. The other team members either are spotters or bearers of the collected crown-of-thorns. With these clean-ups, we try to keep our reefs alive and healthy. 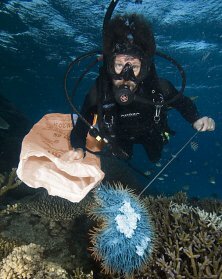 Mind you, the work isn't entirely without risk, because when actually picking up the crown-of-thorns starfish, we have to pay special attention to not get our skin punctured by the crown-of-thorns' countless spines, since these contain potent venom. 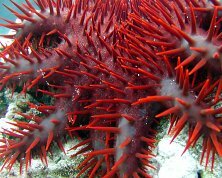 A the crown-of-thorns sting leads to sharp jabs of pain, and if not treated properly, can lead to serious infections. First aid treatment usually involves immersing the affected limb in hot water to neutralize the venom. We invite all divers to join us on one of our crown-of-thorns starfish programs. All our volunteers only pay for the diving at cost price. In addition, everyone will receive a wall certificate to show their participation in the event. If you'd like to know more about the crown-of-thorns problem and how to participate in our crown-of-thorns reef cleanups, use below form.